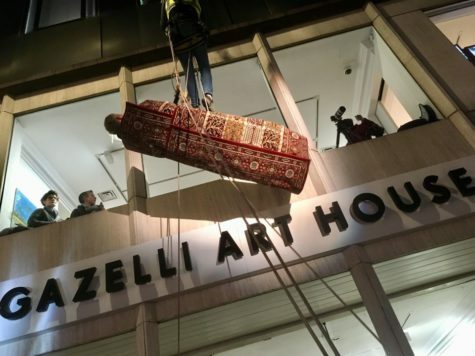 Over the weekend, the intrepid artist-campaigner Fyodor Pavlov-Andreevich was yet again testing his physical limits—whilst also drawing large crowds and stopping traffic—by dangling precariously for five hours outside the upper floor window of Gazelli Art House in Mayfair’s Dover Street. This latest incarnation as Temporary Monument 0, involved wrapping himself in a rug of traditional Caucasian design (associated both with prayer and the wrapping of corpses). The aim of this suspended stint was to raise awareness of another kind of subjugation, namely the plight of the LGBT community in Chechnya, who are suffering acute persecution at the hands of the Chechen authorities. Does This Mean No “Rent”?